Asian Noodle Salad — This easy oriental pasta salad is filled with fresh vegetables and tossed in a sesame soy dressing. Asian Pasta salad is a perfect side dish for outdoor entertaining or can star as a light main course. I think I have shared with you a time of two that my kids prefer raw veggies to cooked vegetables 9 times out of 10. There are exceptions to the rule like with my Healthy Pasta Primavera or Easy Veggie Stir Fry or when they are baked into treats like Carrot Cake Muffins, BUT typically my kids beg for raw veggies. And I am not going to argue with them if they choose carrot salad over maple roasted carrots–just not worth the battle. So whenever I can make a dish filled with fresh vegetables that my kids beg for, you better believe I will put that recipe on repeat. Take this easy vegetable pasta salad with an sesame dressing. This Asian Noodle Salad is filled with fresh broccoli, carrots, peppers, sugar snap peas and tomatoes. And my kids LOVE it! And I love that this easy Asian Pasta is so versatile. Perfect for outdoor events–no mayo, so can sit out at room temperature safely for hours. Perfect for any season–carrots, broccoli and peppers are easy to find year round so you don’t have to wait for summer to make this oriental pasta salad. Kid-friendly–any veggie heavy dish kids love works for me! 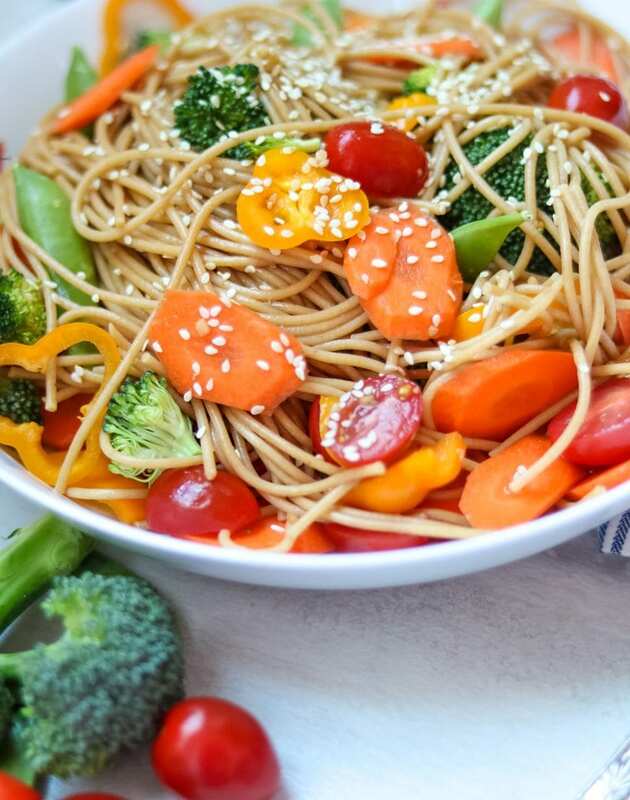 Make a great meatless meal–the whole wheat noodles are filled with fiber and a good dose of protein, making this Vegetarian Asian Pasta perfect for a summer meal or even a great lunch option. 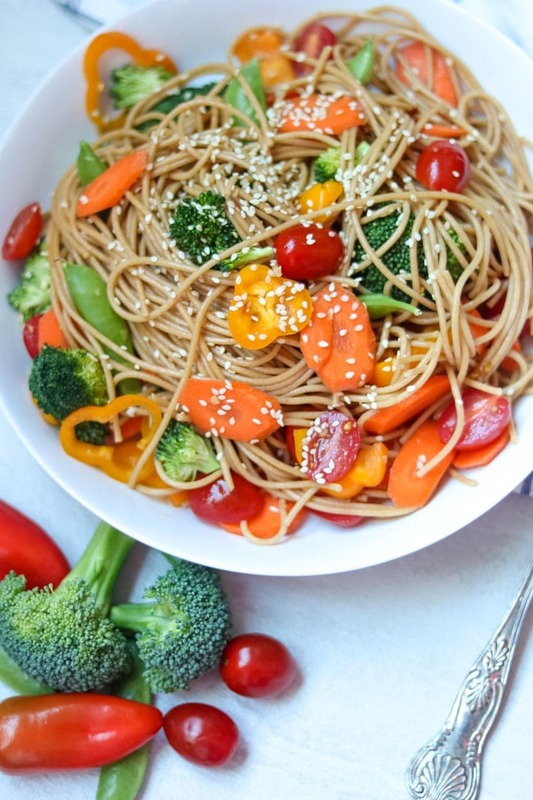 Travels Well–I often pack this sesame noodle salad for my kids lunch as it can be eaten cold or room temperature. It is incredibly simple to make this Asian Pasta Salad. The only thing that is time consuming is chopping the vegetables—of course you could always buy pre-chopped vegetables and this pasta salad would come together with almost no effort. I love to use whole wheat spaghetti, but any pasta shape will work for this Asian Pasta Salad. If your family prefers crisp-tender vegetables over raw vegetables, add the broccoli, sugar snap peas and carrots to the boiling water for the last 3 minutes the pasta cooks. This simple sesame dressing is the perfect balance of sweet and savory and can be made in just a few minutes time. I like to whisk up the ingredients while my pasta is cooking. I recommend using sliced carrots, sugar snap peas, chopped broccoli florets, and sliced yellow or red peppers. I also like to add sliced grape tomatoes. I understand tomatoes are a bit unconventional in an Asian dish, but my family loves the burst of sweetness that the tomatoes add. Steamed Edamame, snow peas, shredded cabbage, or green onions would all be welcomed additions in this oriental pasta salad. After draining the pasta, I immediately toss the noodles with the sesame dressing–this allows the warm noodles to soak up the dressing then add your vegetables. DO NOT RINSE YOUR PASTA AFTER IT COOKS!!! Warm pasta will absorb whatever it is tossed with. If you rinse with water, then it will lack flavor. By tossing your pasta with the sesame dressing, the pasta will have flavor. If you have ever had a bland pasta salad, my guess is they rinsed the pasta with water. That dooms pasta salads from the start. You can serve this pasta immediately, and have a contrast of warm and cold flavors–or you can refrigerate and let the flavors marry and deepen in flavor and serve after several hours or up to 3 days later. Any pasta shape can be used, but I do recommend a whole wheat pasta for extra fiber and protein. Feel free to use a gluten-free pasta if you need this Asian Pasta Salad to be gluten-free (just remember to use gluten-free soy sauce in the dressing as well). I use honey in my Sesame dressing, but you can use brown sugar to make this a vegan pasta salad. This is one occasion I would not recommend using maple syrup, as the flavor is a bit overpowering. This dressing uses a tiny bit of sesame oil–a little bit goes a long way. Be sure to store unused sesame oil in the fridge to keep it from going rancid. If you don’t have rice wine vinegar, use fresh lemon juice. Save your carrot peels, broccoli stems, and other vegetable scraps to make homemade broth. If your Asian Pasta salad is a bit dry before going to serve it (this can happen if you wait several days before serving), add a teaspoon of rice wine vinegar mixed with a teaspoon of soy sauce and toss with the pasta salad to moisten it up. This Asian Pasta salad makes a great meatless meal, pot-luck dish or pair it with Sticky Asian Chicken for a complete meal. Asian Noodle Salad is an easy oriental pasta salad filled with fresh vegetables and tossed in a sesame soy dressing. Whisk all ingredients together while pasta is cooking. Cook pasta in salted water according to package directions and then drain. 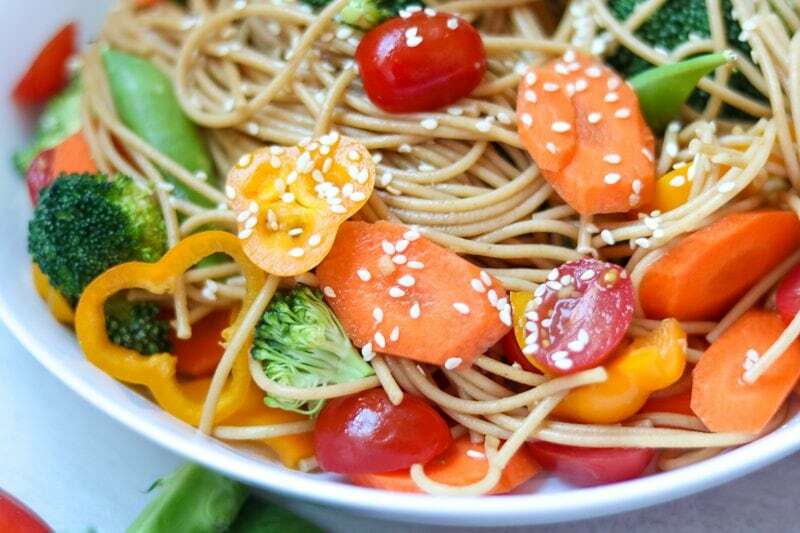 Toss pasta with sesame dressing and add in vegetables to toss. Top with sesame seeds if desired and serve immediately or refrigerate 4-8 hours for flavors to develop and pasta to cool. Use any shape pasta desired. Use any vegetables you like. If you don't have rice wine vinegar, use fresh lemon juice. Keeps for 3-4 days in fridge. This salad tastes so fresh and delicious. I love how easy it is to make, it’s the perfect summertime salad. YAY!! We love to enjoy it on summertime picnics! I actually love the warm and cold contrast of flavors and textures – so GOOD! Great recipe! I tried your recipe last night and loved it! Can’t wait to make it again!